This tour is straight out of the movie, Jurassic Park. Minus Jeff Goldblum. And dinosaurs. 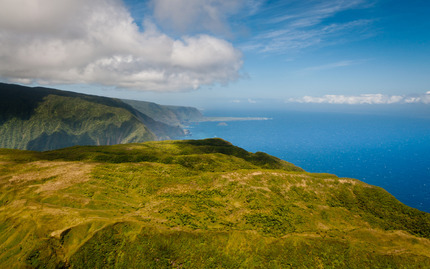 You'll be taking off by helicopter for a thrilling tour around Molokai, renowned for its stunning primal beauty, and where the opening shots of the aforementioned film were shot. There, you'll fly alongside the world's largest sea cliffs, check out dazzling waterfalls up close, and soar through lush valleys with hillsides carved by ancient lava flows. Along the way, you'll learn about the area's natural history, including the seismic activity that sculpted it, and get an aerial look at Kalaupapa Peninsula, home of a Leper colony established in the mid-19th century. Get ready to have more fun than a T-Rex in a petting zoo. Note: This price includes a $50 fuel surcharge.